TANEGASHIMA, Kagoshima (Jiji Press)—An H-2A rocket was successfully launched on Saturday carrying the No. 2 Daichi land observation satellite, which is to aid disaster prevention by monitoring seismic crustal deformation, volcanic eruptions and landslides triggered by typhoons and heavy rain. The rocket was launched from the Tanegashima Space Center in Kagoshima Prefecture at 12:05 p.m., Mitsubishi Heavy Industries Ltd. and the Japan Aerospace Exploration Agency said. After separating from the rocket about 16 minutes after the launch, the No. 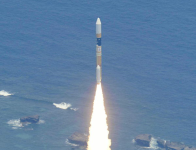 2 Daichi satellite was put into orbit around the Earth. The new satellite is a successor to the No. 1 Daichi, which was decommissioned in May 2011. While the large original Daichi was equipped with radar and an optical camera that could take stereoscopic photographs, its medium-sized successor carries only a high-performance radar that can be used even during the night and in bad weather, so that it can make smaller turns. So far, 23 out of 24 H-2A rockets have been successfully launched, with Saturday’s launch the 18th success in a row. The success rate is now 95.8 percent—above the 95 percent reliability standard widely accepted around the world.